Home Basic Date Questions Conversion Problems How to convert Calendar to Date in Java? Write a program in Java that converts Calendar to Date? For converting Calendar to Date we have to use getTime() method of Calendar class that is present in java.util. * package. * @problem Convert Calendar to Date. Output - How to convert Calendar to Date in Java? 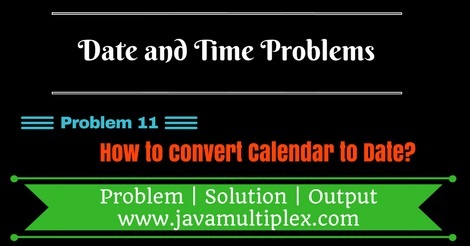 Tags : Date and Time problems, Conversion problems, Calendar to Date in Java, Solution in Java.